Sensors for cooking such as a thermometer provide us essential clues for a better result. However, they only sense temperature on a certain point and the user’s reaction is slow. Thermal cameras are capable of getting thermal images get thermal images of a cooking pan, but it is difficult to utilize those images because the user has to rapidly shift their eye focus from the screen to the cooking pan, and vice versa while cooking. In this paper we propose a visualization technique that applies thermal information on cooking. 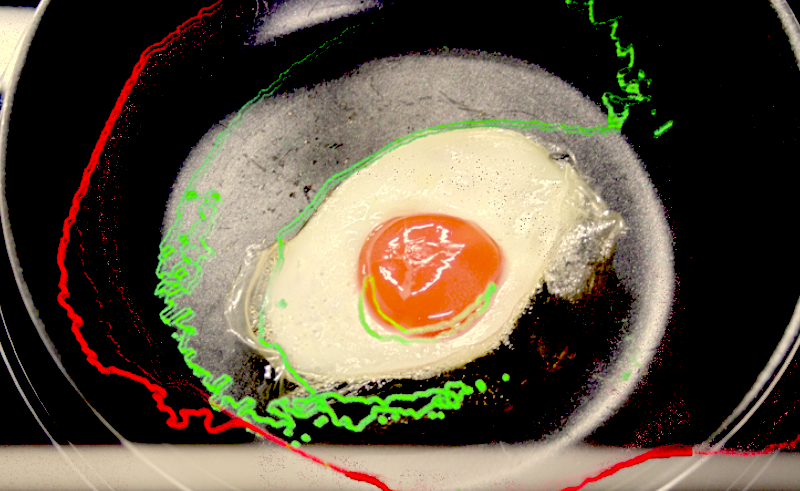 The system enables users to acquire thermal information from the surface of the food on a cooking pan, using a thermal camera and a projection based Augmented Reality (AR) environment. The main contribution of this paper is to provide a technique to overlap thermal clues on the cooking pan without occluding the important information. We conducted a user study and discussed the potential applications of our technique.